Samsung's new mid-range flip smartphone, the Galaxy Folder, has dual display meaning the screen is visible on both sides of the lid. The specs for this device are; a 3.7-inch Amold display with 800x480 res, Snapdragon 4001.7GHz dual-core chip, 2GB RAM, 1820mAh battery, LTE support, touchscreen and runs on Android 4.2.2. 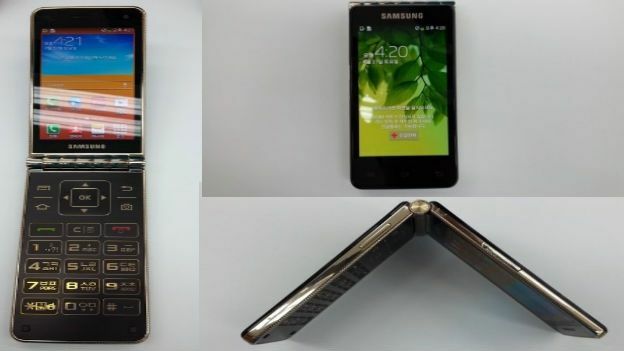 The leaked press shots show new elements to the Galaxy Folder (SHV-E400K) with gold edging on the case and a camera key replacing the W2013's previously dual-sim button. The design is not a new look for Samsung as they have previously released the SCH-W2013 in China, and the SCH-W999. This clamshell design 4G Android smartphone will launch in the Korean markets. According to GsmArena, the Galaxy Folder's official name is the Galaxy Golden. It is unclear whether this new smartphone will launch anywhere else in the world. Samsung has recently announced the ATIV Q dual device laptop with changeable screen allowing the usual position, the ability to 'float' above the keyboard and full flip capability to turn the laptop into a tablet. Read T3's hands-on review here.